Below is a brief description of the curriculum for the Jazz Studies Department. Click on the course number for further details. Jazz Ensembles provide Big Band ensemble experience and are composed of standard big band instrumentation of five trumpets, four or five trombones, five woodwinds, piano, bass, guitar, drums and miscellaneous percussion. The Ensembles perform at festivals, on-campus concerts, and with world class jazz artists. These ensembles provide the future musician/educator with the basics of jazz musicianship, techniques and education. This exposure is the major opportunity in which a future educator receives jazz input for his/her teaching career. The Jazz Combos play at festivals and on-campus concerts. The combos cover a wide range of musical styles and performance level abilities. The top groups perform a majority of student compositions and study advanced improvisational techniques. We also offer beginning jazz combos for those who have never improvised before, but have a background in music. The Elements of Jazz theory program offers a thorough curriculum in all aspects of analytical, aural and conceptual principles common to the jazz idiom. Elements of Jazz I covers basic analysis principles and ear training within the context of the Bebop genre. Elements II offers expanded analysis methodology in more chromatically enhanced repertoire. Elements III takes up John Coltrane’s neo Bebop harmonic language, as well as the application of modes and altered modes. Elements IV delves into the chromatic modal and harmonic innovations of the post-Bop era of the sixties and early seventies. The first semester of this program covers techniques for writing for jazz combos with three and four horns. This course also covers four part thickened line harmonization as it applies to sax soli writing, as well as brass shout chorus ensemble voicings. The second semester of this series focuses on the writing of a major composition for large jazz ensemble that is performed at the Jazz Composers’ Concert at the end of the Spring semester. A one year course of study for the jazz major which starts with African-American music in the nineteenth century and traces the emergence and development of jazz through the examination of the work of the major stylistic innovators. The course covers the evolution of the music up to the present day. Students are required to discuss and present papers in class about the major figures of the past and also the leading personalities of contemporary trends. A graduate seminar in jazz theory required for the Master of Music in Jazz Studies. Topics include analysis and composition of music in the chromatic modal style, analysis and discussion of developments in creative music during the last twenty five years, weekly journal entries on assigned reading as well as pedagogical principles in jazz education. The Graduate Seminar in Jazz History looks at the music and its leading musicians, from the point of social context and aesthetics. The social contexts examined are those of Black America itself and also of America in a collective sense. The writings of musicians, critics, and music scholars are read and discussed, with the aim of understanding the impact of this new music on American society and also its impact abroad. The opinions, values and aesthetics of jazz musicians, from the music’s inception to the current era are studied, interpreted and contrasted with the writings of jazz critics and other contemporary influential writers. 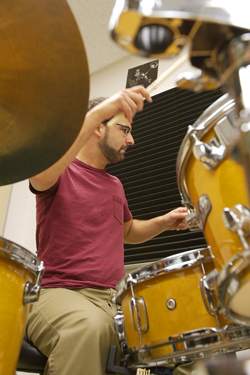 Comprehensive Musicianship is a unique four-year program which provides the core musicianship training of music majors and minors. Courses include harmony, ear training, sight singing, counterpoint, form and analysis, arranging and orchestration, composition, improvisation, opportunities for rehearsing and conducting small and large ensembles, and performance. The courses deal with musical styles of all periods, ethnic and world music, as well as two courses in jazz. The primary objective of Comprehensive Musicianship is to teach students to deal intelligently with all kinds of music. The jazz music tradition represents a legacy of great depth and diversity. This rich legacy has at its foundation the contributions of the art form’s originators, African Americans. It is the purpose of this class to not only acquaint students with the music, but to enable them to appreciate and admire a form of artistic expression that is uniquely American. This is an Explorations course in the Humanities and Fine Arts. Completing this course will help the GE student to do the following in greater depth: 1) analyze written, visual, or performed texts in the humanities and fine arts with sensitivity to their diverse cultural contexts and historical moments; 2) describe various aesthetic and other value systems and the ways they are communicated across time and cultures; 3) identify issues in the humanities that have personal and global relevance; 4) demonstrate the ability to approach complex problems and ask complex questions drawing upon knowledge of the humanities. Jazz and rock music are of pivotal importance to life in American in 20th and 21st Centuries. This course is a practical approach to hearing jazz and rock music with understanding and pleasure, through the study of representative jazz and rock musics and the great musician throughout their history. Internet studies, in-class demonstrations and live concert attendance will be utilized throughout the semester.